Read just about any textbook and watch about any movie and what do you hear? The universe and all of life began millions and billions of years ago. And what most people, even Christians, don't realize is that this mantra of evolutionary teaching actually calls Jesus Christ a liar, God the Father a liar, and it even calls God's Word a liar. 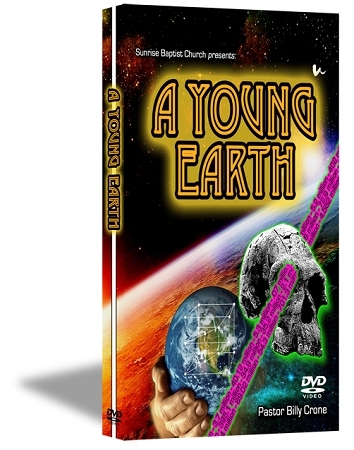 Therefore, A Young Earth exposes the falsehood of evolutionary dating methods and reveals beyond a shadow of a doubt that we really do have A Young Earth just like the Bible states. You will explore such things as, the Evidence of Space, the Evidence of Earth, the Evidence of Logic, the Fallacy of Carbon Dating and all other evolutionary dating methods, the Circular Reasoning of the Geologic Column and finally the Rapid Formation of Rocks, Caves, Stalagmites and Stalactites, and even Fossils. But not only that, you will hear direct quotes from the evolutionists themselves saying that yes, we very well could have A Young Earth! After watching this series, you too will come to the same conclusion as Malcolm Muggeridge who stated, I myself am convinced that the theory of evolution, especially to the extant to which it's been applied, will be one of the great jokes in the history books of the future.